Read on for bios for the figures as well as the official pics. Thanks to tmntmikey23 from the forums for the heads up. A master thief, Anton Zeck is hired by former Russian arms dealer Steranko to break into Shredder’s Lair and steal his legendary helmet. With his bright purple Mohawk, unlimited gadgets, z-ray glasses, and the ability to become invisible, Anton’s thieving opportunities appear endless. But when Shredder catches wind of his plans, he sends Anton down a tube and into a tub of mutagen Ooze with the DNA of a warthog. The thief transforms into Bebop, a half human, half warthog mutant! A former Russian arms dealer, Steranko has ended his gun-dealing days and begun to collect rare weapons and armor. With his collection nearly complete, he hires Anton Zeck (Bebop) to steal the ultimate prize, Master Shredder’s legendary helmet. But things go really, really bad! Shredder finds out that Steranko’s the mastermind behind the theft and sends him flying into a mixture of mutagen Ooze and Rhino DNA! Steranko instantly mutates into the incomparable half human, half Rhino known as Rocksteady. This tough and mysterious female ninja is a member of the Foot Clan and has ties to both Shredder and Splinter. But when Shredder devises a snake mutagen—hoping to mutate the Turtles into rat-eating reptiles that will destroy Splinter—Karai’s life takes a drastic turn. Shredder accidentally knocks her into the Ooze and she mutates into a swift three-headed snake. Karai goes on a rampage, stopping herself just before killing Splinter. Her impressive control allows her to mutate back and forth between snake and human form. After failing Shredder one time too many, Baxter Stockman is intentionally sprayed with mutagen to teach him a lesson. 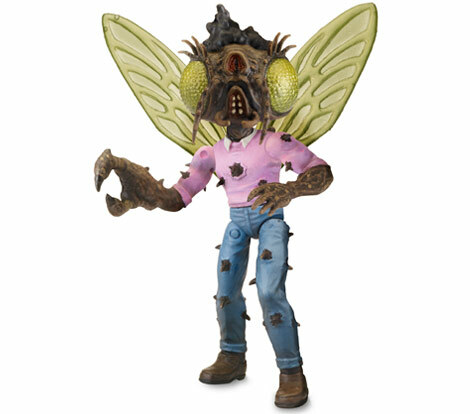 A nearby fly enters the transformation and Baxter becomes half man, half fly—Stockman-Fly! With the power of flight, strength, and a disgusting regurgitation skill, Stockman-Fly is a formidable enemy. Tiger Claw was mutated by the Kraang when he was just a kid. Half man, half tiger, he’s brought from Japan to New York as Shredder’s new secret weapon against Splinter and the Turtles. 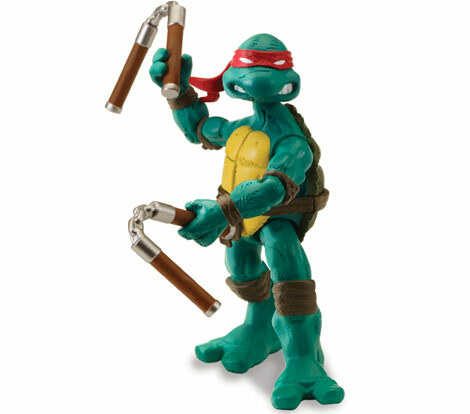 He’s missing his tail and he licks skim milk like a kitty-cat—but this dangerous assassin fights like nothing the Turtles have ever seen, especially when he fires his cannon weapons! In 1984, Peter Laird and Kevin Eastman created and published a 40-page black and white comic, and the Teenage Mutant Ninja Turtles were born. The comic was dark and edgy, and the look of the Turtles reflected that style. In the color version of the comics, all of the Turtles were the same shade of green and all of their bandanas were red. Only their signature weapons helped to visually differentiate each brother. 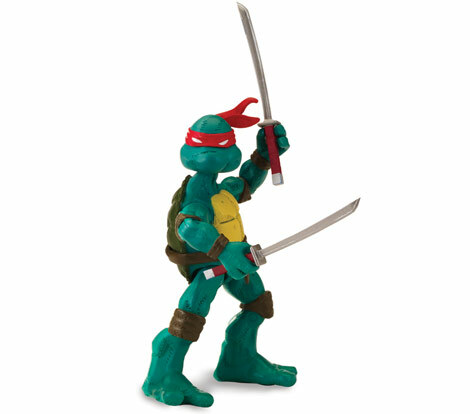 These action figures pay homage to that earlier TMNT character style. To scrounge around for new product pages, do this. Change the XXXX to a 3 or 4 digit number. For example, 1055 is Bebop, 1060 is comic Raph, etc. There are some blank pages in between, so expect those to be filled with product pages in the near future. werent the comic tutrtles supossed to be part of he classics line, with better paint and articulation than the basic line? Bebop and Rocksteady in the show finally, nice. Little wonky, but fits with the Nick style. Comic turtles - I dig em. I'll pick up those 4 as basics for 9 bucks no problem, easy sub for the NECA ones that are a bit pricey. Didn't know they had new episodes, need to catch up! Yeah they're finally finishing the second season in Sept. The classic Turtles look great but the rest are just meh. Really looking forward to seeing Bebop and Rocksteady on the show though. 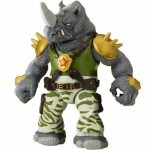 The Rocksteady and Bebop figures look good. Bebop is still a little oddly thin, but not nearly as bad as the animation model he's based on. I'll most likely get them. The comic Turtles look good. I was hoping Raph would get released with a comic as well, but it sounds like Leo and Mikey are the only one's getting that treatment. I'll probably get Raph anyways. Though I wonder how much, if any, of that black paint will be on the production figures. I kinda hope they eventually do figures based on the new comics. 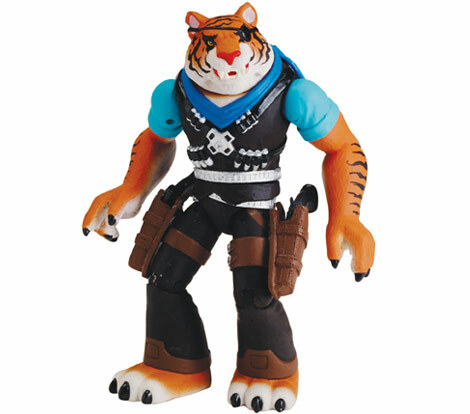 Tiger Claw looks good, but I really want to see what his production figure looks like. I want to get him, but that might change when I see the figure in-person. Karai... I would still prefer a human version of her, but I'll probably get this. I've always wanted to see a mutant snake in TMNT. Hopefully they'll get around to making a normal version of her. No, they're releasing TRU exclusive versions of the Leo and Mikey figures packed with a comic book and different packaging, and then a TRU exclusive Leo 3-pack that has this figure, the first Nick Leo figure, and their original '88 Leo figure. These were always a part of the Basic line. If I recall correctly, at SDCC, it was announced that there would be a standard Karai figure to go with the mutant version. 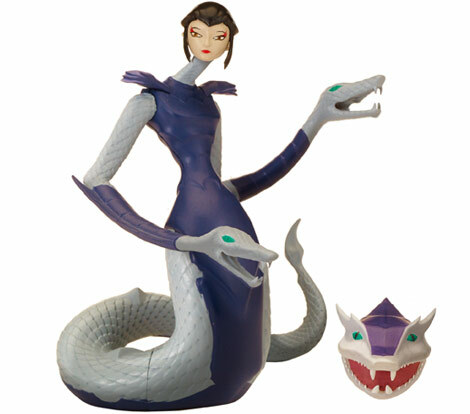 There was a slide shown for the snake version, and the human figure as well, though, I believe it was just shown as a shadow or a picture of Karai herself. I have to go back and look at the SDCC Playmates panel sideshow and take a look. That said, I love all the new takes on the classic characters thus far, and I'm excited especially for Tigerclaw, as he is my fave villian on the show. I hope that the classic comic turtles are better distributed than previous TRU exclusives, because my local stores are terrible. 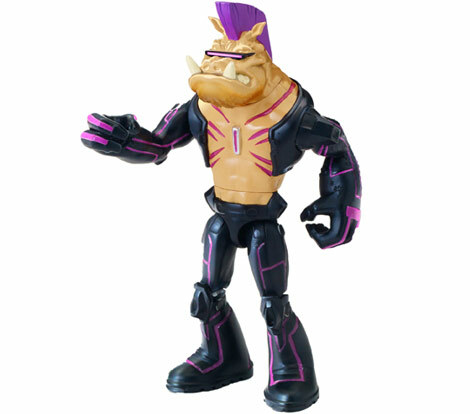 I never even saw the wave two classics BeBop and Rocksteady, or the movie classics series thus far. I watched a video of the panel, and the only mention of human Karai was that the mutated figure would have her normal head, and that her snake head would be a mask you can put over it. Unless you specifically want the Leo and Mikey with comic pack-ins or the Leo 3-pack, finding these shouldn't be an issue. The basic figures aren't exclusive to TRU. Bebop and Rocksteady! Comic toitles! Bebop and Rocksteady are definite buys, and I just happen to have two spaces left on my TMNT wall for toys to hang. Between that and the fact that I finally have a blimp (never had one as a kid), it's looking like my turtle buying days are over with, no matter how much I like Newtralizer and Tigerclaw. It's nice to see that Tiger Claw seems to retain most of his important coloring. Only thing noticeably missing is the white and black on his arms. I like that the comic Turtles have different packaging. Might be worth keeping them in-package. Since they're in the Basic line, I hope this means Playmates will be doing more non-Nick Basic figures. At least some more comic figures would be nice. Question: In the recent picture posted, why are all the Turtles' mask red? I thought they were suppose to be different color for each Turtle. Am I missing something here? In the original comics they all wore red masks. They were changed for the cartoon to make it easier for kids to differentiate between the characters (and make it easier to sell toys). I'm kinda hoping that something on the back of the packaging explains that. Otherwise I see a lot of kids and parents being confused and passing on them. Not that these are aimed at the younger audience, but it might affect sales. It would have dipped into the already limited budget these figures have, but it might not have been a bad idea to include a swapable mask gimmick and have Leo, Donney, and Mikey packaged with their later colors and have their red masks included as accesories. Wouldn't mean anything for Raph, and would annoy fans who would want to keep them MOSC, but would help lessen confusion. As big of a shell-head as I am, even I didn't know about the original mask color till a couple of years ago. These will all be bought by me at some point (I'm pretty much all-in for the Nick TMNT basic figures at this point). But of all the new ones coming, I'm really digging the comic-based turtles since that's who brought me to the dance (so to speak). 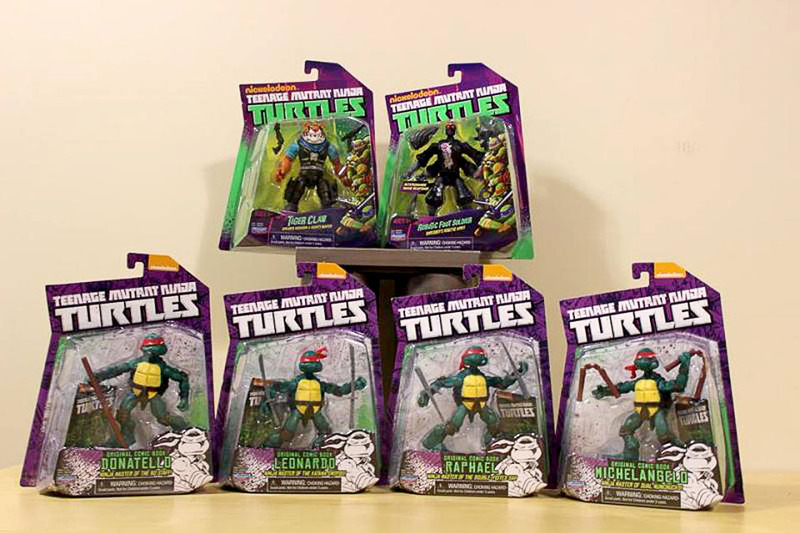 It looks like Playmates went to some trouble to make each turtle have a different pose in package, as well as a pretty large nameplate right up front. That should help a bit. 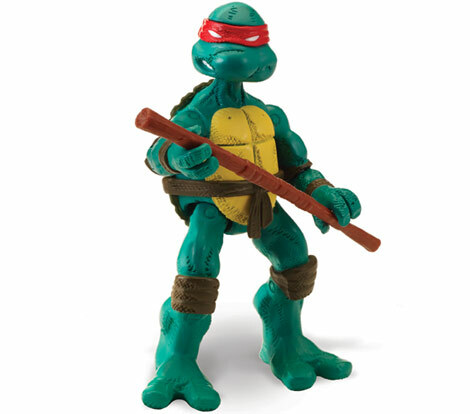 Are the Mirage Comics inspired Turtles considered a part of the Classics line? The packaging looks much closer to the Nick series than it does to the Classics line we have had in the past. They aren't part of the Classics line. They're listing them with the Nick TMNT stuff as "Basic" figures. Not confusion over who the figures are, but confusion over why all four of them have red masks/bandanas. 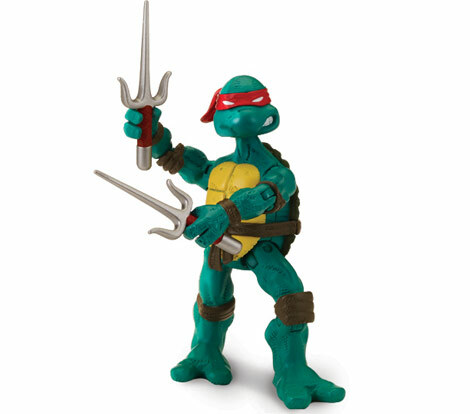 Are the Mirage Comics inspired Turtles considered a part of the Classics line? No. They are part of the Nick TMNT line and are the same scale as those figures. I think I am all set with the Mirage Turtles, as I have the superior NECA figures. 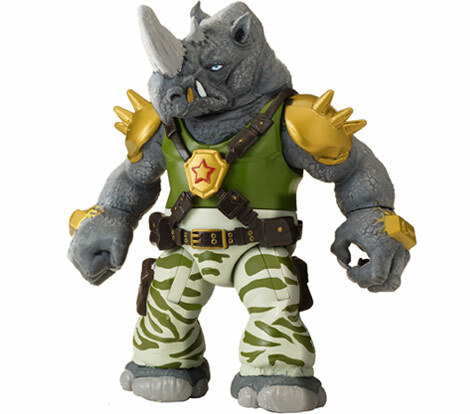 But I am looking forward to Bebop and Rocksteady.